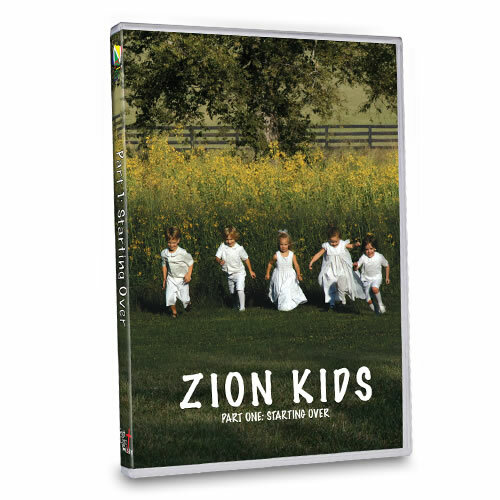 Zion Kids Video Series: Part I: Starting Over - a 30 minute DVD that is a fun and exciting combination of music, dance, and Bible lessons to help children learn the basics in a way that is just as much fun for the parents as it is for the child. This series of videos will transform the whole household for it is full of the knowledge of God, God's music and worship lifted up to Him!! Children will learn essential morals such as obeying their parents and being kind to one another. Children learn by imitating other children and Zion Kids is full of children that are Godly. Notice as you turn off the TV and turn on Zion Kids how your whole family will be different and happier! Watch how God will transform the entire family as each member at every age learns more about Him. We are so excited about what God is doing. These videos were a joy to produce simply because they were an extension of our everyday life in God's kingdom that He called Zion. So come along and let's get started on our adventures with the precious Zion Kids. My kids ( 2 and 1 years old) love to watch Zion kids. They dance to the music and when there is talking they sit with their eyes glued to the tv. I love this DVD as well. I know that I can let it run and that they are learning Truth while I get some chores done. from Brentwood, TN LOVE it!! Praise God for this incrediable DVD! I have 4 children ranging from 5 months to 5 years and they all love watching it. This series from God keeps my infants and toddlers attention better than Baby Einstein videos, and it keeps their focus on GOD all day! I recommend this to EVERYONE!